One of my pet interests is lost crops, or largely forgotten ones-- species that were important in the past which are either completely lost from cultivation today or very nearly so. They serve to remind us that the ethnographic present does not provide a full range of potential economic activities nor the full range of crops. They demonstrate that archaeobotanical evidence can provide important broadening of our list of potential crops to consider in future breeding and sustainability efforts. An endemic rice of South America can now be added to the list of lost crops. from phytolith anaylses through a stratigraphic sequence at the site of Monte Castelo in southwest Amazonia, dating to between 5300 BP and 700 BP, which includes rice husk phytoliths (the double-peaked cells) and bulliform throughout. The proportion of rice increased somewhat in the past 4000 years, but shifted especially towards a much higher ratio of husk types to bulliforms, suggesting the concerntration of husk phytoliths that one might expect from dehusking or harvested rice spikelets. It is at this stage that the shape of the husk phytoiths also starts to change, with phytoliths getting wider, taller and with more pronounced peaks. These are the kinds of changes that may be indicative of a domestication process and be a proxy for increasing grain size. The change takes places somewhere in the upper levels of the site, which are unfortunately not well constrained in dating, except being younger than 4000 BP and up to 700 BP or so. 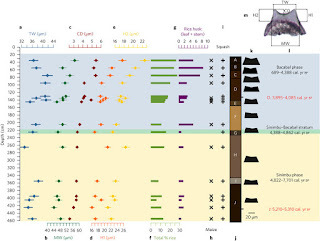 This suggests that the inferred domestication process took place or was even ongoing upto shortly before Colombian arrival from Europe and Amazonian population decimation. One can quibble over whether changes in husk and inferred grain size increases must be human caused. The classic case of such a change in Chinese rice is decidedly NOT about domestication, as it takes place in sites South of Yangtze at the transition from the LGM to much warmer conditions, i.e. around 18,000-16,000 years ago. A full 10,000 years before the appearance on non-shattering rice spikelet bases appear-- domesticated by definition. When originally published by Zhao (1998 Antiquity) this was mistakenly dated to the Holocene, and thus inferred to represent domestication, but this falled a false equations (domestication because change is start of Holocene; start of Holocene because advent of ceramics could not possibly be any earlier). We now know the advent of ceramics transition in China took place around 18,000 years ago at Yuchanyan and possibly even earlier at Xianrendong, as already discussed for at least 7 years (e.g. Fuller et al. 2010). while domesticate rice, i.e. that was dependent on humans for dispersal, evolved during the middle Holocene, with the earliest large assemblage of non-shattering spikelet bases at Baligang by ca. 6500 BC and predominance in the Lower Yangtze as late as ca. 4000 BC (for a updated summary see here). It now appears most likley that the morphological change in husk phytoliths in South China was driven by the rapid climate change and especially the increase in carbondioxide which has major repercussions on plant productivity and morphology (see experimental work by Cunniff et al 2010), and thus the near doubling of carbondioxide that took place in the millennia just after the LGM (along with increasing temperature) ought to have hade major effects on rice productivity and aspects of morphology). However, in the past 4000 years it seems unlikely that there were any climate or carbon dioxide shifts on quite the necessary scale, which makes the inference of a local rice domestication process much more likely. A shift in grain size, however, would be expected to be accompanied by some selection for reduced shattering-- as this co-evolves in all of our better documented cereal domestications, most notably in Asian rice. Thus good flotation samples, with the required fine mesh of ca. 250 or 300 microns, ought to produce small charred rice spikelet bases. 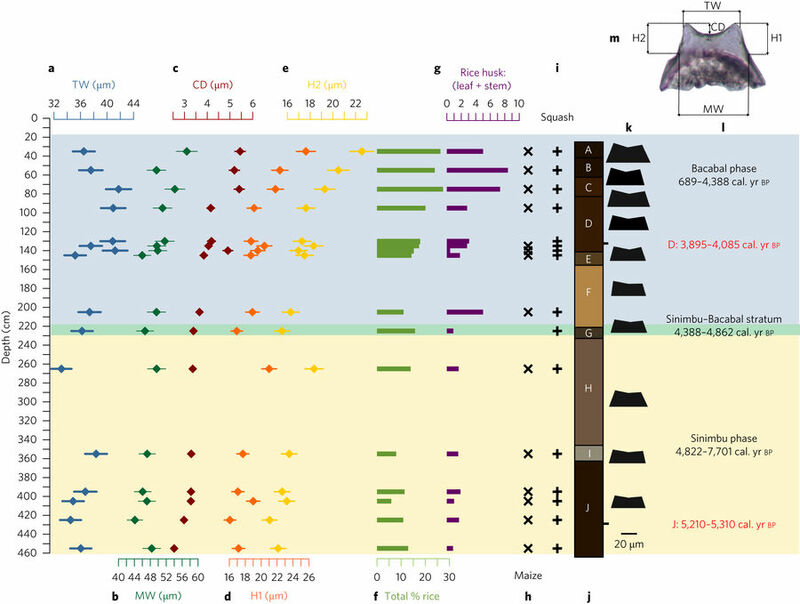 Recent experience suggests that everywhere we look, and do the requisite flotation, in tropical Asia, we find now that rice spikelet bases greatly outnumber charred grains and this tells us that they survive well and are archaeobotanically recoverable. This is also true to the major rice growing areas along the ancient Niger river. Some macro-remains would seem the obvious next step to pinning down more details about the evolution of this lost rice of South America. It would be highly unexpected if selection for larger grains did not take place alongside increases of indehiscent spikelet bases, as these co-evolve in other well documented cereals (as illustrated in a PNAS 2014 article). It is also highly likely that increase in grain size implies management of soils, i.e. some sort of cultivation. This is contrary to the novel, but rather unconvincing, hypothesis of the authors that grains would have been encased in clay and dropped into the water. They cite as an ethnographic parallel systems of reseeding American wild rice (Zizania palustris) stands in the Great Lakes region of North America. But in that context there is no evidence for prehistoric grain size increase or domestication processes.The rice represented at Monte Castelo was likely a productive annual, as the authors note, and could have been encouraged by burning of competing vegetation after seeds are shed, in which case selection for seed size increase can be expected from the levelled playing field conditions of freshly cleaned fields which put a premium on rapid seedling establishment against competition from conspecific seedlings. South America boasts 4 indigenous wild rice species, Oryza alta, O. latifolia, O. grandiglumis, and O. glumaepatula, and only the last has annual ecotypes. South America's O. glumaepatula is also an AA genome, like domesticated Oryza sativa or Oryza glaberrima, and thus this suggests something inherently attractive for, or conducive to, domestication in the AA wild rices. Like Oryza species everywhere these are water-loving grasses, but there are still two ends of a spectrum from perennials in deeper water and annuals and places that are seasonally dry. 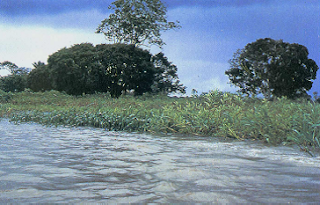 Oryza alta, which can form mats along river margins, is a perennial (see, for example the photo at left lifted from Duncan Vaughan's 1994 monograph on the wild rices). Annual Oryza are prolific seasonal grain producers, and thus lent themselves easily to forager intensification, and it was such annuals that were ancestral of the early cultivars of Asian indica and aus rices, or African glaberimma (from wild annual O. barthii). By contrast perennial rices are less prolific grain producers due to investment in perennating stems, roots and more leaves. Thus Asian rices when available ought perhaps be expected to be used resources. The other continent with annual AA genome wild rices in Australia, where these are found in the northern parts. Lets see some archaeobotanical work carried out there, in the region of Oryza meridionalis, as one might expect parallel evolution for utilization and even management there.